Click the image below to see this unique project built in Houston, Texas! – I have a pool and want a place for guests to use the restroom without tracking water through the house, but how much does adding an outdoor restroom cost? – Where should we put it? – How big should it be? – I just want a place for guests to rinse off, can we just have a shower head somewhere? – Outdoor bathrooms average about $15-$20K. There are exceptions where some bathrooms are more or less than that, but this is the average range. Included in that $15-$20K is roughly an 8×6 bathroom with a sink, toilet, and maybe a stand up shower unit. It will have foundation depth concrete, exterior walls to match or complement existing home finishes, shingled roof, plumbing/vents, at least one frosted window for natural light and finished/painted interior with trim. – Typically you want to put the bathroom off to the side of the property or connected to the end of a patio cover so it is out of the way. Location may also be dictated by the location of the sewer clean out pipe that we would have to tie into. The closer to the clean out pipe, the more cost effective we can be on the plumbing. – Yes, we can add just a shower head for guests to rinse off. We can also build a privacy wall if requested for the showering area. – The cost may be higher than expected for homeowners. When we build a bathroom, we are building a really small house. That one room needs to be vented, sealed to stay dry, and should also have some temperature control unit. If you don’t air condition that bathroom space, it will feel like a sauna in the middle of the summer. But what doesn’t hurt is to ask! We are happy to come out, take a look and give you a free estimate! Click on the image below to discover details of this gorgeous featured project in Houston, Texas! For more details on this beautifully rustic project built in Kingwood, Texas… click here! At Texas Custom Patios, we really get to know our customers. 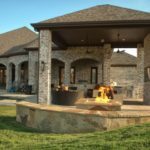 When you choose to build with us, you get your own project developer who will get to know you, your goals, your style, and will oversee your entire outdoor living project, from start to finish. Part of that process is knowing your budget and maximizing your budget. Truly one of the first questions asked is, “how much does something like this cost?” (while holding up a picture of a backyard vineyard from a castle in France). But by knowing your budget, we can help you get the most out of every dollar. Another way to get what you really want within the budget, is to build your project in phases. Yup, we don’t have to do it all at once! Let’s just say you would like an outdoor kitchen, but your current budget is blowing out the gas flame on that idea. We can pour the concrete and build the cover portion, but only lay the groundwork for the plumbing. Or you really want a fire feature, but you won’t really need it until November, we run the gas line now and light the fire later! There’s also the option for financing, read more here! Covered patios, cabanas, sun rooms, outdoor kitchens and bathrooms, you name it, we’ve done it! Check out our gallery of work, here! The exterior of your home often gets forgotten about in the winter months, and sadly spring cleaning isn’t just meant for the inside of your home… so you know what the means! Rain, wind, sun… all of these things can be dirt’s best friend when it comes to sticking to your patio furniture, flooring, and your grill. We have some easy and affordable ways to spruce up for spring. All fabric (think cushions, pillows, even umbrellas) needs to be rinsed, scrubbed and rinsed again! It’s best to use a soft-bristled brush and a little laundry soap. Some mild scrubbing and a good rinse will do the job! Wrought iron is strong durable and will stand the test of time except when it comes to staying nice in moist climates… hello Houston humidity! To get the algae and rust away, use a stiff-bristled brush and dishwashing detergent. Fill a bucket (1/2 gallon) with warm water, add 1 Tablespoon of liquid detergent and 1/2 cup of vinegar and get to scrubbing. Less durable than wrought iron, but twice as annoying. All the grooves can make it hard to get out the grime. Firstly, wipe down the furniture with a wet soapy soft cloth (use a mild soap), then run a toothbrush through there lightly (shaking out the dirt in between swipes). When completed, let dry in the sun. Simply rinse with a hose, wipe down with a mild dish detergent, rinse again and let dry! Power washers can sometimes do more harm than good, so we suggest a little dishwashing detergent (if you haven’t notice by now, this is the one ingredient wonder), warm water and a push broom! If it’s good for tile, it’s good for stamped concrete! Use the same method. It’s a 5-step process, visit here! This is a little more detailed, visit here! And last but not least, let there be light, look around for any empty sockets or burned out bulbs… replace and light!